As we all know, Marian Rivera, GMA's once again bringing back Mars Ravelo's Masterpiece back on the TV screen. 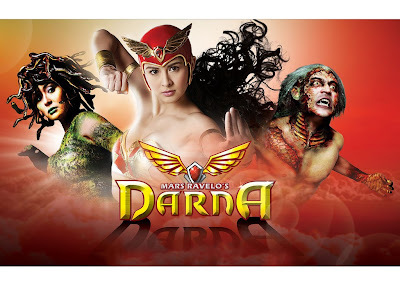 Last August 3, 2009, Darna starring Marian Rivera as the title role is officially launched. Like how all press conference goes, the event introduces most of the main cast that is included on the lineup. Among the stars present thyat night is Marian Rivera who plays the title role of Darna and Narda, Iwa Moto as the Snake Woman Valentina, Mark Anthony Fernandez as Narda's love interest Eduardo, Paolo Contis as Kobra, Rufa Mae Quinto as Francesca, Nadine Samonte as Babaeng Impakta, Francine Prieto as babaeng Ugat/Tuod, Ehra Madriga as Babaeng Lawin and Maggie Wilson as Babaeng Linta. Included on the extended casts are Alfred Vargas, Robert Villar, Rita Avila, Jestoni Alarcon, Janice De Belen, Caridad Sanchez, Celia Rodriguez, and a lot more. According to the trailer, Darna's plot will revolve on a second generation Darna. It means, there is an existing Darna and Marian is the successor. Narda is raised on an orphanage where she togather with Eduardo (Mark) and Valentina (Iwa) lives until the day Eduardo is adopted and set to leave the orphanage. And just like other Darna plots, it also revolves around the relationship between Narda and her friend Valentina and eventually on the course of the series they will became mortal enemies as Darna and the Babaeng Ahas. The plot is so typical that I don't bother expecting more on that. On the designs, personally my favorite is Paolo Contis' caharacter design and I commend the makeup artist for doing a good job on him. It is so realistic, even much better than the makeup of Kamandag. Then the worse one is of Valentina. I like the snake hair but the costume is so bland. Compared to the costume of 2005 valentina, I like Alessandra de Rossi's costume than Iwa's. Lastly, I don't like what they did with the Babeng Lawin character. I expect a more organic character than a completely mechanical one. I'm not sure if the effects team in Darna is the same team behind Mulawin but they could have recycled those materials as the Babaeng Lawin's wings. But let's see if this mechanical seraph will work on screen and I may retract my statement about it. And again I want to acknowledge Bong Leal for the new Darna costume. It is new but retains the classic look that all of us love. As a comic lover, despite the countless mishaps on TV adaptations of our favorite characters on comic books we still see ourselves seating in front of the TV screen waiting for the pilot episodes of this new telefantasyas. Maybe we are still hoping that someday this legendary characters will come to life on the shining glory that all comic lovers expect. So let's all gather around this coming monday August 10, 2009 and witness the return of the ever loved super heroine of the Philippine comic book pages on GMA 7.
ok nga yung mga costume designs..
at wag bara bara tulad ng ibang series nila..
mukhang mas comics na comics ang dating ngayon ng Darna compared dati..